As most readers know, Bitcoin is now a monstrous bubble that has the dubious distinction of exceeding in magnitude all previous bubbles in history, going right back to the Tulipomania in the 17th Century. Its recent ascent has been steeper than the north face of the Eiger and even the vertical face of Half Dome in Yosemite. As anyone with even basic knowledge of speculation knows, this means its days are numbered, and it won’t be long before a brutal crash occurs that wipes out latecomers and even dramatically slashes the profits of earlier arrivals on the scene. The only propellant this market has now is the “Greater Fool Theory”, which is where you buy simply because you believe an even bigger idiot will turn up later to buy it off you at a higher price – needless to say, this works until it doesn’t. The start of futures trading on the CBOE today is seen as a dangerous fundamental magnet that has pulled the price vertically higher over the past few weeks, sucking in naïve traders in droves, like the siren song drawing sailors to their doom. Bitcoin’s rise to the dangerous round number $20,000 level over the weekend is seen as the “Greatest Fool” arriving on the scene amid great fanfare and pageantry. Let the slaughter begin! Let’s not be churlish about this, however, it is important to give credit where it is due. Those who got in early on this Bitcoin mania are true geniuses who have every reason to feel proud of themselves, having made themselves a fortune from even relatively modest stakes. The problem for many such investors though is that they don’t know when to call it a day and jump ship – many overstay their welcome and end up losing most of their gains. If you, dear reader, are one of these fortunate individuals you should get the hell out with the minimum of delay and consider yourself lucky. 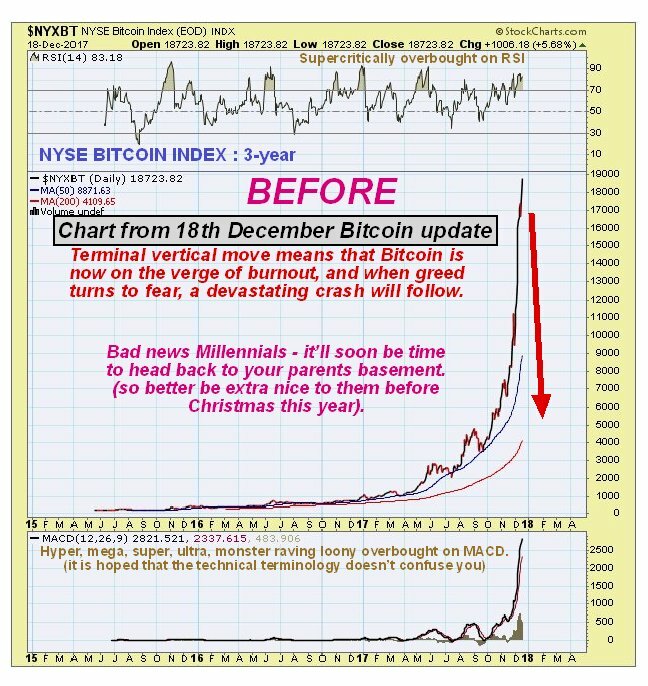 Sure you might miss some more gains short-term, but when this thing goes down it will be a lot faster than the Hindenburg and leave behind a massive impact crater, as unbridled greed changes in a flash into visceral fear and blind panic and all the recent lemmings disappear straight over the cliff edge – it will go into freefall and bids will evaporate.